My Second International Stair Race! 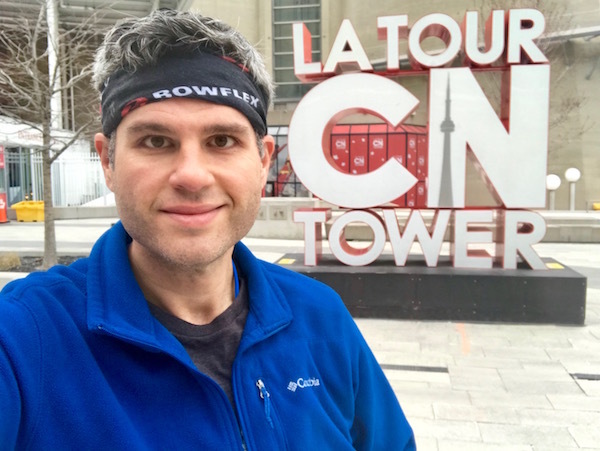 (CN Tower Climb For Nature Race Recap) | Keep It Up, David! 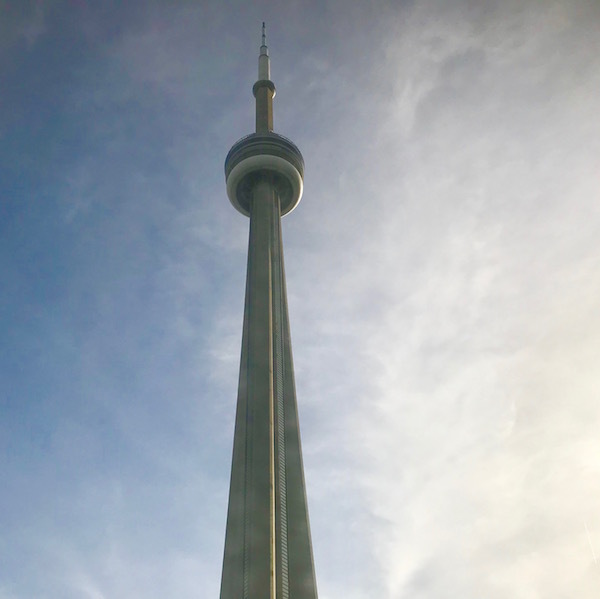 Although it’s a completely different country, Toronto is only about a 4.5-hour drive from where I’m living in metro Detroit, so it was an easy trip. My parents came along too! 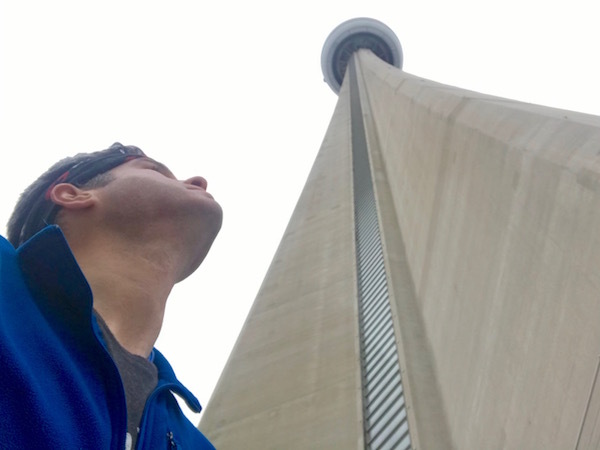 I hadn’t been to Toronto since college, and I’d forgotten how big and tall Toronto is. Endless skyscrapers! The tallest structure, though, is the CN Tower. 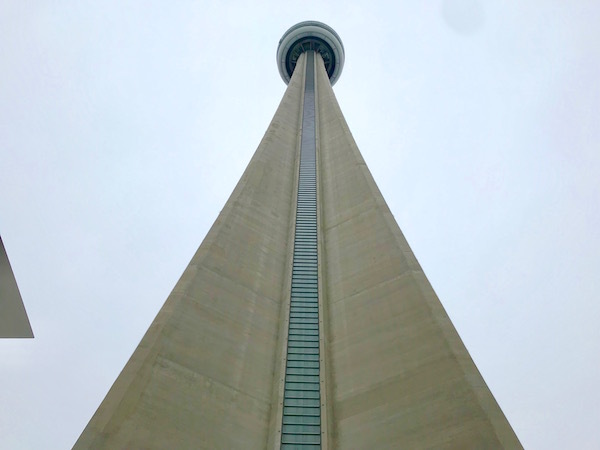 It’s 1,815 feet tall, and was the tallest free-standing structure in the world from 1976, when it was completed, until 2007. 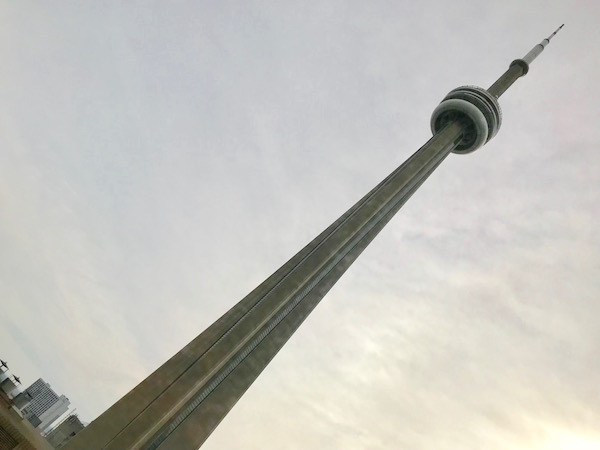 Now it’s the tallest free-standing structure in the western hemisphere, and the ninth-tallest in the world. 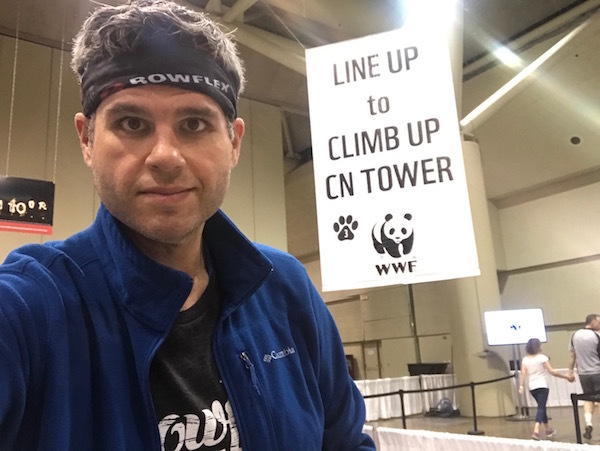 The CN Tower Climb for Nature benefited the World Wildlife Fund, making the first stair race I’ve done that specifically supported an environmental cause. Cool! It’s a huge event, spanning two days. There were over 2,500 participants! I went on Sunday, the second day. 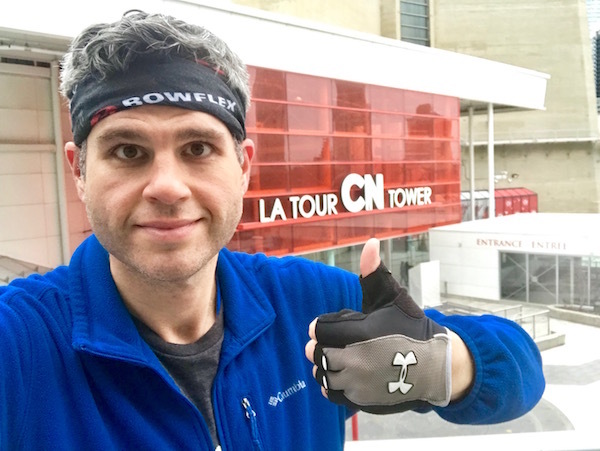 My parents and I stayed at a hotel a block away from the tower, and I woke up at 6am to get ready and put on my Bowflex gear. 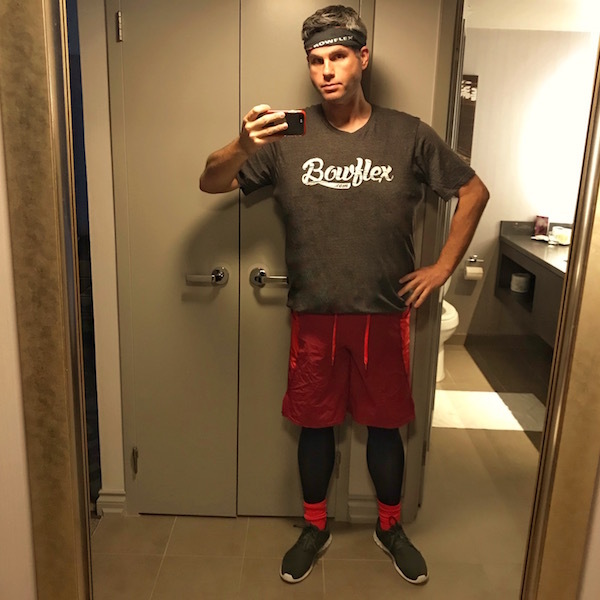 I’m wearing the Bowflex shirt and headband because they sponsored me for this race. The people at Bowflex are so awesome! It’s an incredible feeling having a huge fitness company in my corner. And I’m not blowing smoke when I say that I love their products. My Max Trainer engages all the muscles I use during these races, and I used it all week long to get ready for this race. Go visit the Bowflex website now because their Tax Refund Sale is wrapping up in a couple days! 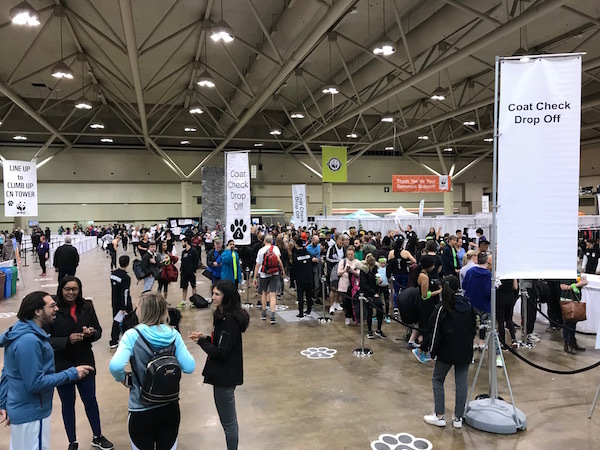 Since the CN Tower lobby isn’t big enough to accommodate the thousands of people that were racing, all the staging for the event happened at the convention center right next door. The informational email I had received a few days prior said that the check-in tables opened at 7am, so I was there at 6:55am. Hundreds of people were already there! There were no assigned start times, so after checking in and dropping off my jacket at the coat check, I was free to enter the start queue whenever I wanted. I entered it immediately. Why delay the inevitable? This is where the pictures stop. You aren’t allowed to bring anything into the stairwell – no phones, headphones, mp3 players, or watches. I left my phone in my jacket pocket. The only thing on me was a wristband with my timing chip. I popped a piece of gum in my mouth, but two minutes later a security guard saw me chewing and told me to spit it out. They brought people over to the tower to groups, and it was maybe a quarter-mile walk. I warmed up on the way, doing a light jog and some high knees. I’m glad I did, because things moved quickly at the tower. We went through metal detectors, headed down some corridors, and up a couple flights of stairs. There, a guy told us to tap our wristband against a mat on a table, and that would start the clock, and our climb would start. Most races stagger the start, letting a racer enter every 10 or 15 seconds, but there was no such stagger here. I was at the tail end of a group of 15 or so racers that all entered at approximately the same time. I like getting to a race about an hour beforehand, providing ample time to get ready, stretch, and not feel rushed. This experience was the opposite. I’d say that only 15 minutes or so passed between my arrival at the event and my entry into the stairwell, and it was rather refreshing. No time to psych myself out; no time to let my nerves get the better of me. Entering the stairwell at the back of a pack of people provided an immediate problem: passing. The first 10-12 flights were tight and crowded, and while I passed many people, there were many more I wanted to pass. But that was tough, because we were packed like sardines. The crowd kept moving, though, and I passed when I could, and quickly grew to appreciate the masses. It forced me to slow down a little bit, and that’s a good thing, as I tend to expend too much energy at the start of these races anyway. The crowd thinned out after the first dozen flights or so, but it remained pretty crowded. I stepped to the outer rail many times to let faster climbers pass, but I was passing others much more than I was being passed. Each landing was numbered. Each landing also had artwork, drawn by kids, to encourage us or thank us for participating. Because the World Wildlife Fund was hosting the event, much of the artwork featured animals. Lots of pandas and lions. About 50 flights up, I realized I had no idea how many flights there were. I had found a good rhythm, was feeling strong and moving at a good clip, and was motivated by all the passing I was doing, but I also like to sprint, as much as I can, the last five stories. I had no idea when to start that sprint. There was another racer that kept me on my toes. I don’t know his name, but he was wearing a canary yellow tank top, and we climbed in tandem most of the way. I had the lead at the beginning, and then he passed me, and we went back and forth the whole way up. Having someone else to stay ahead of – or keep up with – was incredibly helpful. It provided an extra push. I noticed a slight cramp, in my side, around the 70th or 80 flight, but by that point in the race it was just another ache on the list, and the list already included all my leg muscles, my core, and my lungs. I don’t remember if it went away, or if it just merged with all the rest of the pain I was feeling. I started sprinting in the 130s, but I had to pass a couple people, and that slowed me down a little bit. But I had the stairs to myself for the final 6 or 8 flights, so I turned on the gas and used the remaining, sputtering fumes to get myself up the final few flights. A guy at the top reminded us to tap our wristband against the timing mat on our way out of the stairwell, which I did. I exited the stairwell and entered… another stairwell. The race was over, but there were more stairs to climb? What is going on? I took one look at the new stairs, and my whole body said ‘no.’ So I collapsed off to the side, out of the way, and sat against the wall. A paramedic asked me of I was ok, and all I could manage was a nod and a thumbs up. I let my heart rate come down a little bit, but I didn’t stay there too long – only a minute or two – before standing up and tackling the rest of the stairs. There were 12 more flights of stairs, with most having 8 steps, before I exited onto the lowest observation level. My hunch is that, during those 12 flights, we were climbing past a few non-public floors – maybe equipment/mechanical spaces and the like. I have no idea why those flights couldn’t be part of the race, though. It’s baffling. I got some water at the top, and soaked in the view. It was a overcast day, but the views were stunning. Lake Ontario stretching out to the horizon, and hundreds of skyscrapers, all below me. There’s also a glass floor you can stand on, and seeing the sidewalk over a thousand feet below is always a thrilling (and bone-chilling) experience. Lots of awesome photos, if only I had my phone! …and I also got my time. I climbed 1,776 steps in 19 minutes, 12 seconds. Woohoo! I hadn’t given myself a goal time, but I honestly wasn’t expecting a time under 20 minutes, based on my times from races in other buildings. I finished in 449th place, out of 2,531 racers. Top 20%! This building is taller, by 100 more steps, than the US Bank Tower in Los Angeles, which I’ve raced up six times. 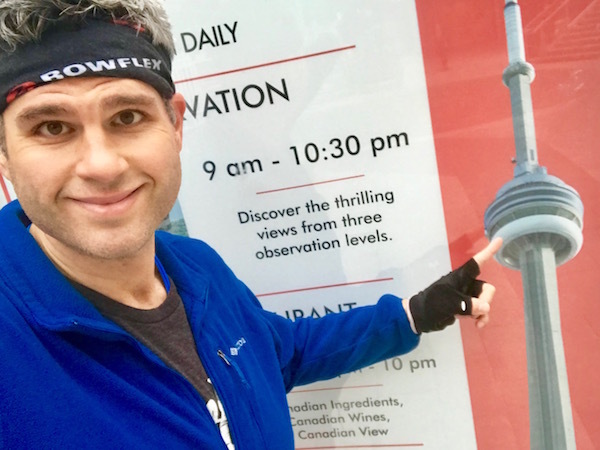 My time in the CN Tower was faster than three of my races there! Canada is now the third country I’ve raced in, after the US and France, and Toronto is the 22nd city I’ve raced in. This was my 70th stair race. WHOA! 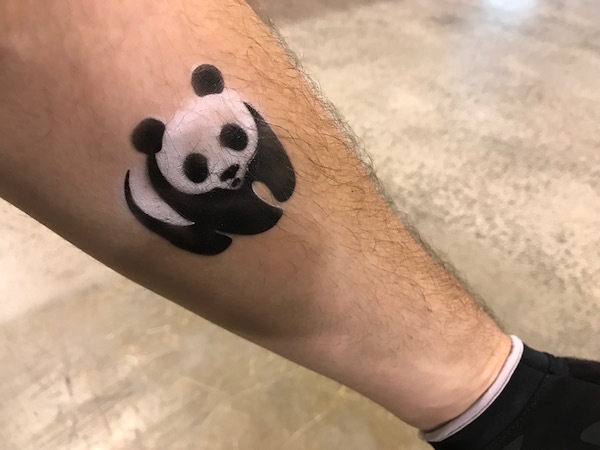 A huge, enormous, gigantic, gargantuan thank you to Sandee, who made a very generous donation to the World Wildlife Fund on my behalf, so that I could participate in this race. She single-handedly brought me to my fundraising goal! Follow me! I’m @keepitupdavid on Facebook, Instagram, Twitter, and Snapchat! There’s also a “Sign Me Up” box on this page (at the top of the right-hand column) where you can subscribe to receive new posts via email! This entry was posted on Sunday, April 14th, 2019 at 9:38 pm and is filed under Uncategorized. You can follow any responses to this entry through the RSS 2.0 feed. You can leave a response, or trackback from your own site. Great job on your stair race!!! You are doing a great job with staying on target for your year goal AND you are smashing these races! I love that you were able to find someone else your pace to race against. I have found myself doing that during races. Seriously, these stair races make me want to find a building to climb and do a race….hmmmmmm. Yes! You absolutely should! Search “Stair Training 101” on my blog to find my post about how to find and prepare for a race.